3 Scott Meyers, Software Development Consultant http://www.aristeia.com/ Copyrighted material, all rights reserved. Slide 2 What do I Know? 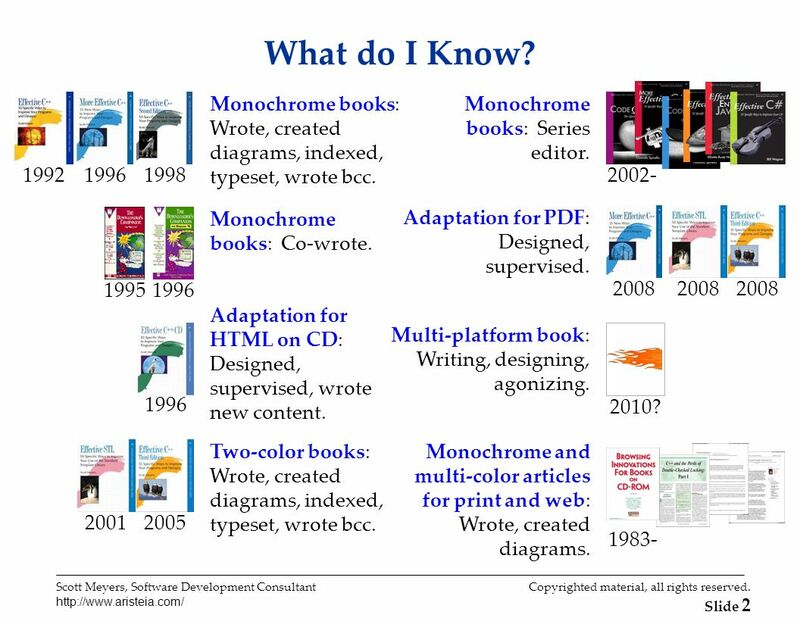 199219961998 Monochrome books: Wrote, created diagrams, indexed, typeset, wrote bcc. 1996 Adaptation for HTML on CD: Designed, supervised, wrote new content. 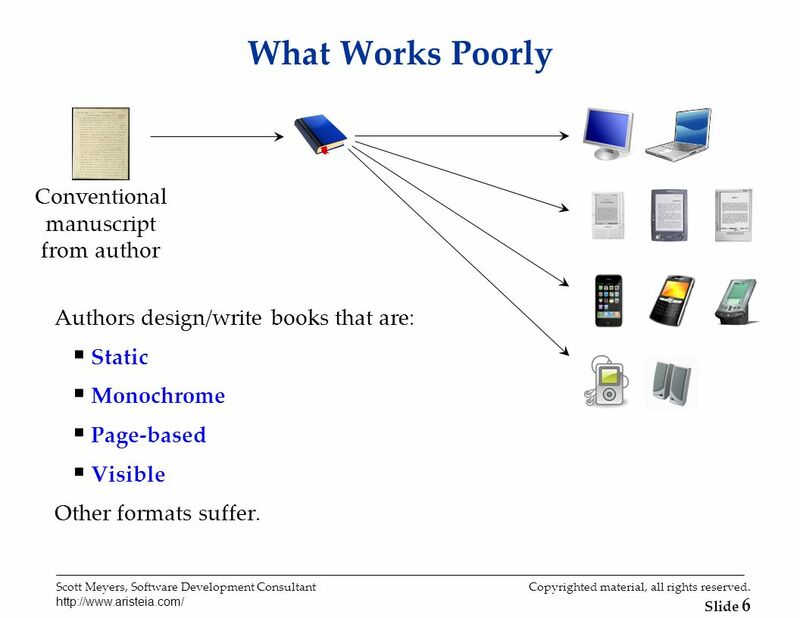 20012005 Two-color books: Wrote, created diagrams, indexed, typeset, wrote bcc. 2008 Adaptation for PDF: Designed, supervised. 19951996 Monochrome books: Co-wrote. 2010? Multi-platform book: Writing, designing, agonizing. Monochrome and multi-color articles for print and web: Wrote, created diagrams. 1983- 2002- Monochrome books: Series editor. 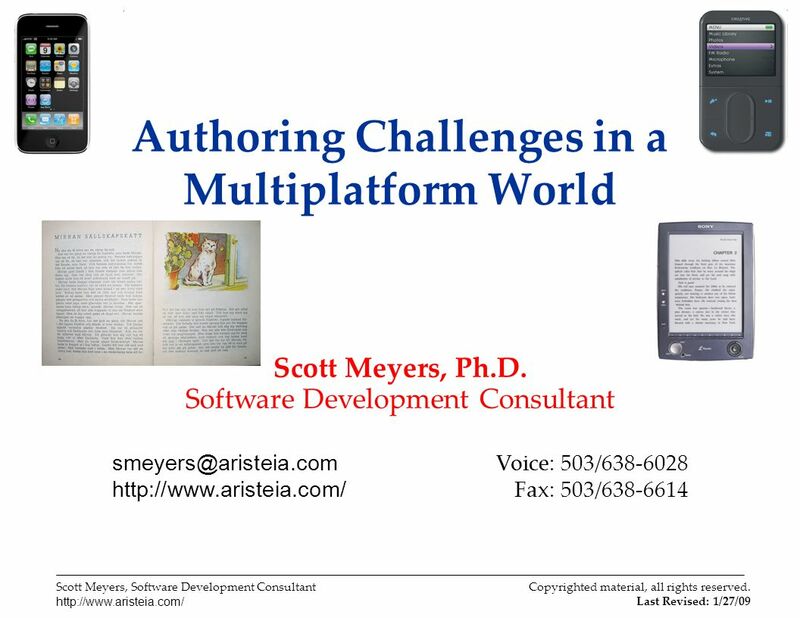 5 Scott Meyers, Software Development Consultant http://www.aristeia.com/ Copyrighted material, all rights reserved. 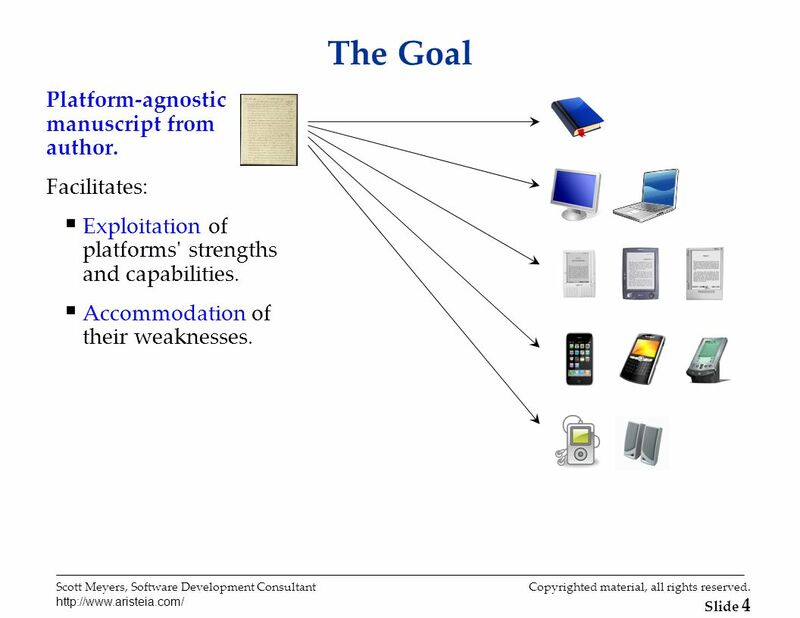 Slide 4 The Goal Platform-agnostic manuscript from author. Facilitates: Exploitation of platforms' strengths and capabilities. Accommodation of their weaknesses. 8 Scott Meyers, Software Development Consultant http://www.aristeia.com/ Copyrighted material, all rights reserved. 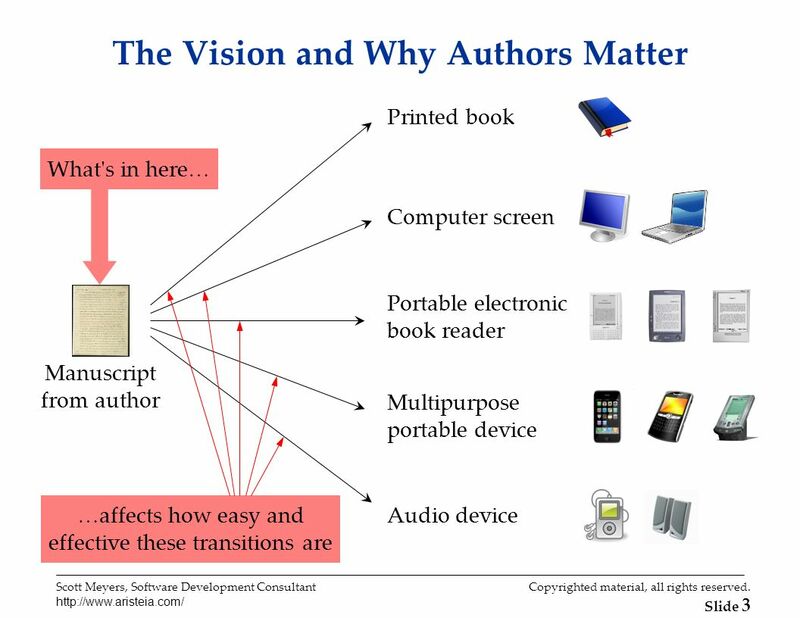 Slide 7 What may go in a Platform-Agnostic Manuscript? Anything that works in printed form. The usual suspects: Text, diagrams, tables, photographs, etc. 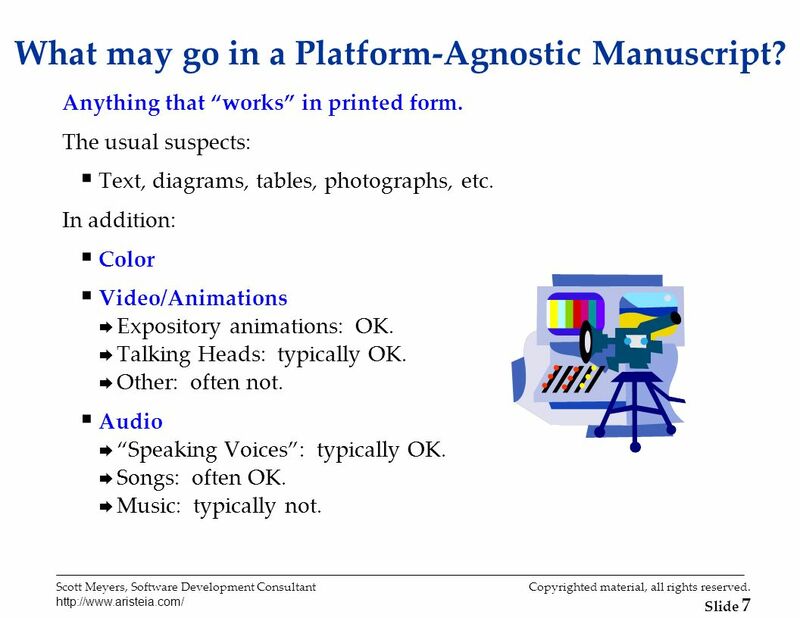 In addition: Color Video/Animations Expository animations: OK. Talking Heads: typically OK. Other: often not. Audio Speaking Voices: typically OK. Songs: often OK. Music: typically not. 9 Scott Meyers, Software Development Consultant http://www.aristeia.com/ Copyrighted material, all rights reserved. 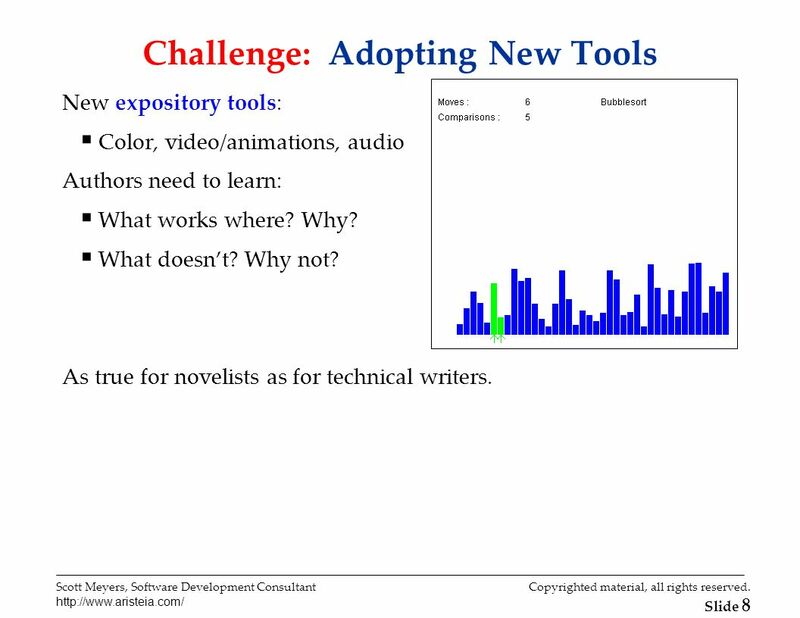 Slide 8 Challenge: Adopting New Tools New expository tools: Color, video/animations, audio Authors need to learn: What works where? Why? What doesnt? Why not? As true for novelists as for technical writers. 10 Scott Meyers, Software Development Consultant http://www.aristeia.com/ Copyrighted material, all rights reserved. 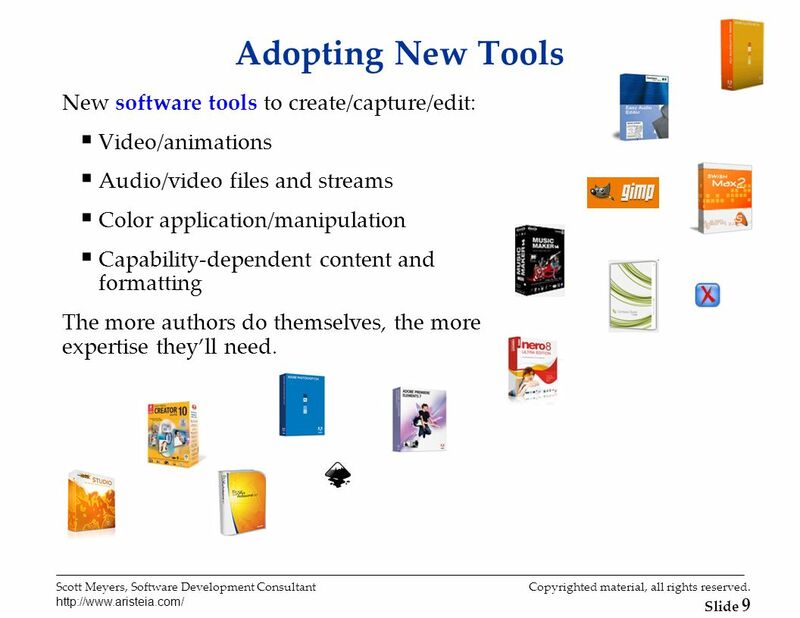 Slide 9 Adopting New Tools New software tools to create/capture/edit: Video/animations Audio/video files and streams Color application/manipulation Capability-dependent content and formatting The more authors do themselves, the more expertise theyll need. 11 Scott Meyers, Software Development Consultant http://www.aristeia.com/ Copyrighted material, all rights reserved. 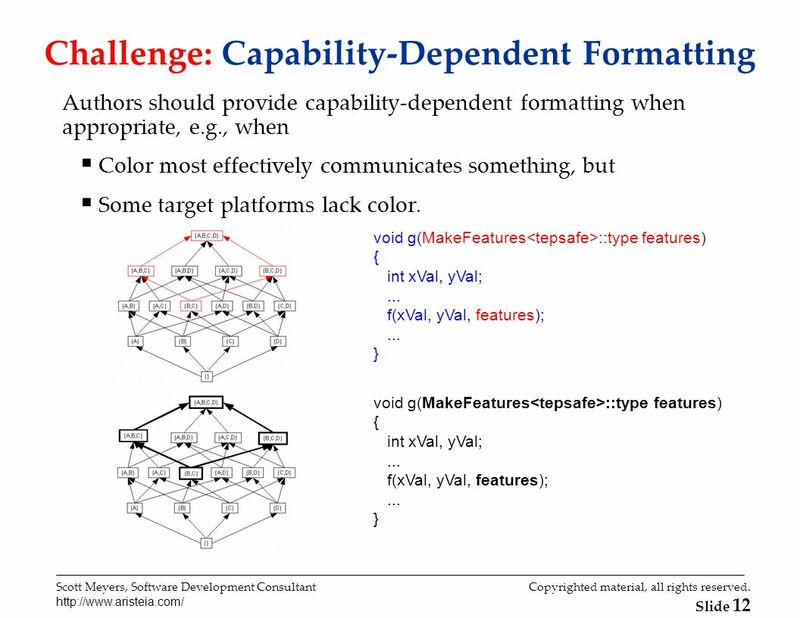 Slide 10 Challenge: Capability-Dependent Content TTS does a decent job on prose : Tables not so much : Graphs, diagrams, charts, etc., are similarly troublesome. From State of the Computer Book Market, Part 2: The Technologies, Mike Hendrickson, OReilly Radar, February 22, 2008, http://radar.oreilly.com/2008/02/state-of-the-computer-book-mar-20.html. In the table immediately below, you can see how the cat_family groupings have performed (total units) both by quarter and yearly results. 12 Scott Meyers, Software Development Consultant http://www.aristeia.com/ Copyrighted material, all rights reserved. 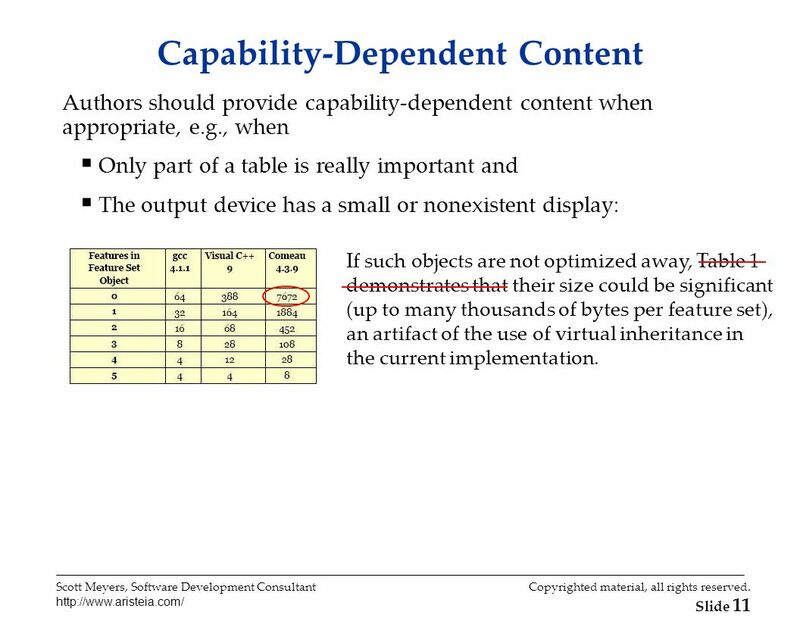 Slide 11 Capability-Dependent Content Authors should provide capability-dependent content when appropriate, e.g., when Only part of a table is really important and The output device has a small or nonexistent display: If such objects are not optimized away, Table 1 demonstrates that their size could be significant (up to many thousands of bytes per feature set), an artifact of the use of virtual inheritance in the current implementation. 14 Scott Meyers, Software Development Consultant http://www.aristeia.com/ Copyrighted material, all rights reserved. 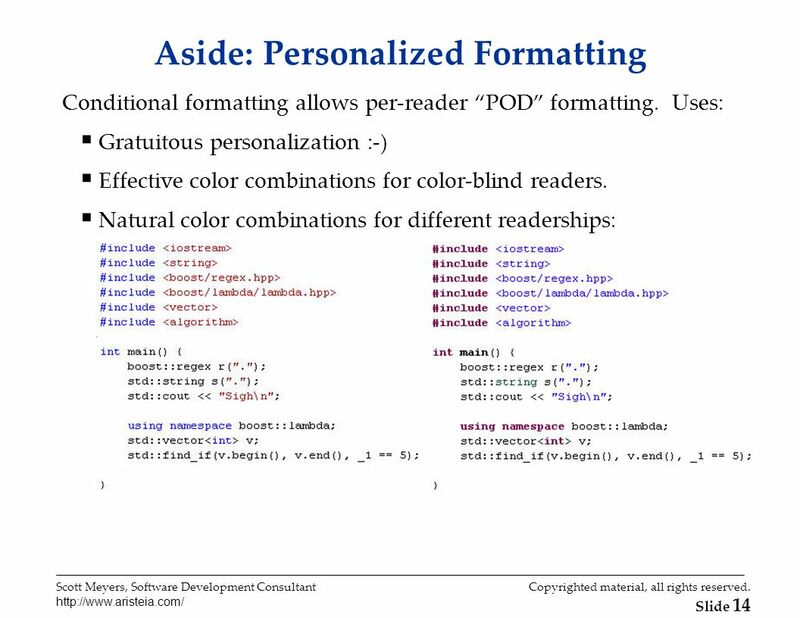 Slide 13 Capability-Dependent Formatting The more colors, the less practical to use line styles, etc. 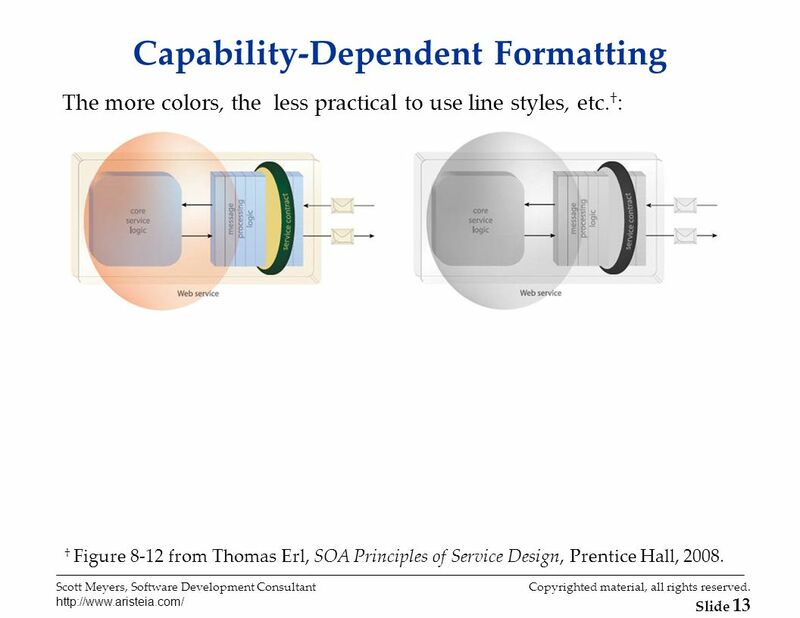 : Figure 8-12 from Thomas Erl, SOA Principles of Service Design, Prentice Hall, 2008. 16 Scott Meyers, Software Development Consultant http://www.aristeia.com/ Copyrighted material, all rights reserved. 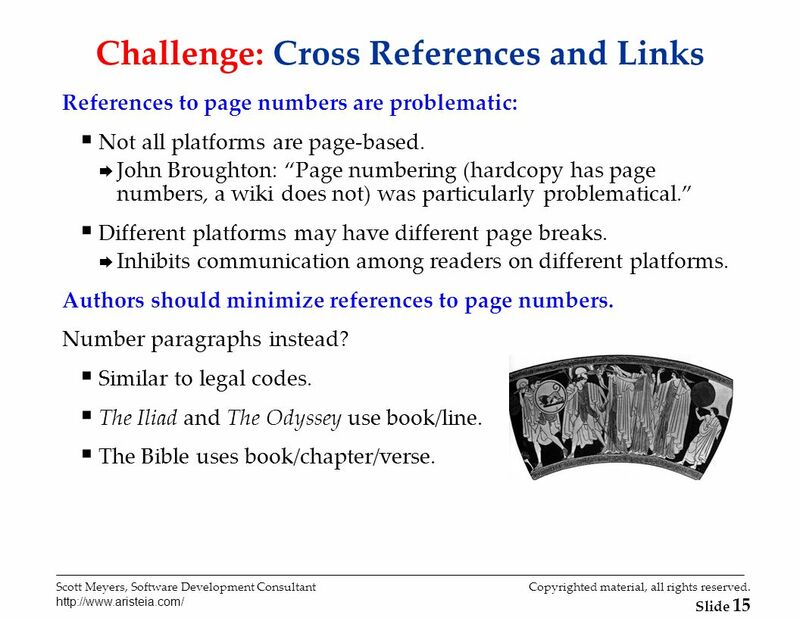 Slide 15 Challenge: Cross References and Links References to page numbers are problematic: Not all platforms are page-based. John Broughton: Page numbering (hardcopy has page numbers, a wiki does not) was particularly problematical. 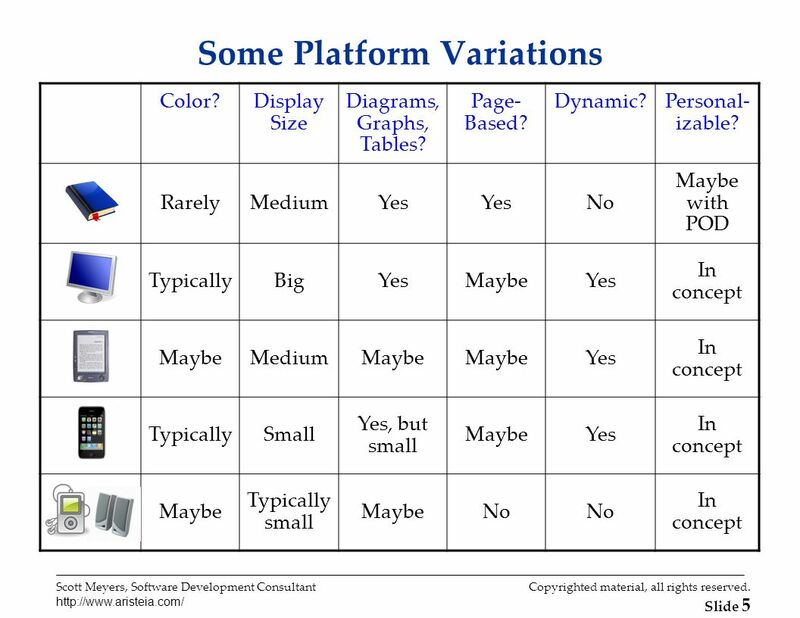 Different platforms may have different page breaks. Inhibits communication among readers on different platforms. Authors should minimize references to page numbers. Number paragraphs instead? Similar to legal codes. The Iliad and The Odyssey use book/line. The Bible uses book/chapter/verse. 17 Scott Meyers, Software Development Consultant http://www.aristeia.com/ Copyrighted material, all rights reserved. 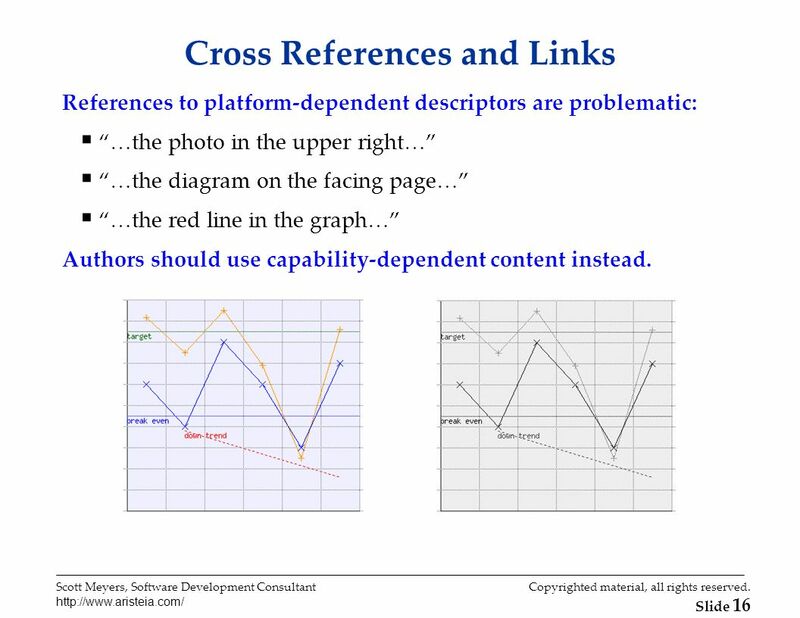 Slide 16 Cross References and Links References to platform-dependent descriptors are problematic: …the photo in the upper right… …the diagram on the facing page… …the red line in the graph… Authors should use capability-dependent content instead. 18 Scott Meyers, Software Development Consultant http://www.aristeia.com/ Copyrighted material, all rights reserved. 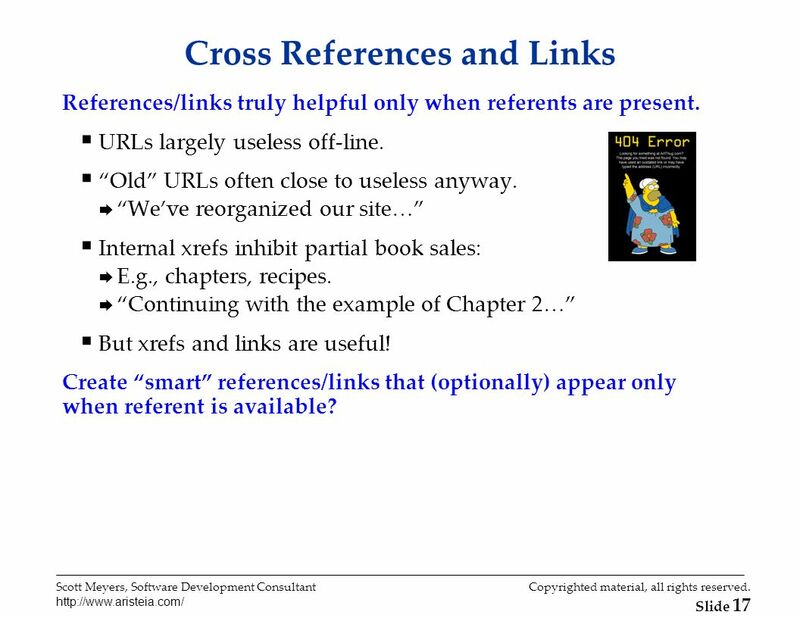 Slide 17 Cross References and Links References/links truly helpful only when referents are present. URLs largely useless off-line. Old URLs often close to useless anyway. Weve reorganized our site… Internal xrefs inhibit partial book sales: E.g., chapters, recipes. Continuing with the example of Chapter 2… But xrefs and links are useful! Create smart references/links that (optionally) appear only when referent is available? 19 Scott Meyers, Software Development Consultant http://www.aristeia.com/ Copyrighted material, all rights reserved. 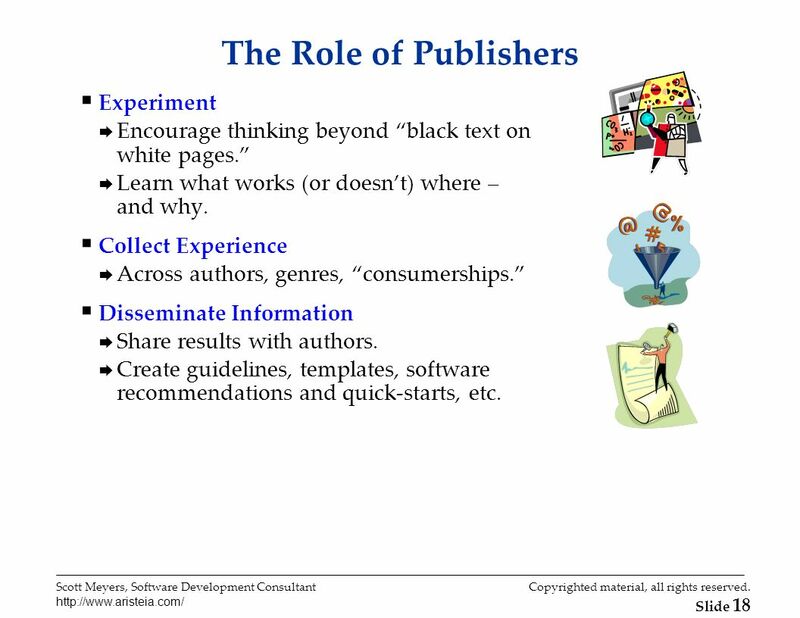 Slide 18 The Role of Publishers Experiment Encourage thinking beyond black text on white pages. Learn what works (or doesnt) where – and why. Collect Experience Across authors, genres, consumerships. Disseminate Information Share results with authors. Create guidelines, templates, software recommendations and quick-starts, etc. 20 Scott Meyers, Software Development Consultant http://www.aristeia.com/ Copyrighted material, all rights reserved. 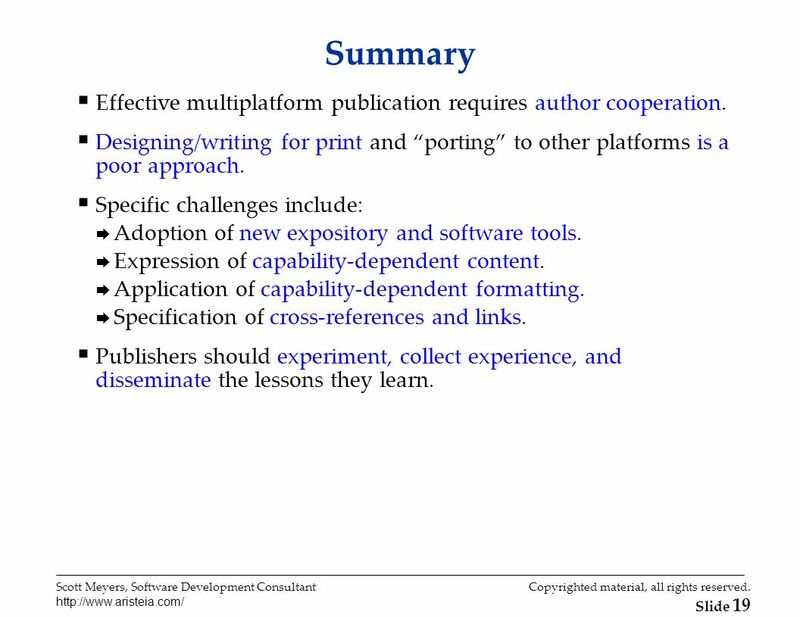 Slide 19 Summary Effective multiplatform publication requires author cooperation. Designing/writing for print and porting to other platforms is a poor approach. Specific challenges include: Adoption of new expository and software tools. 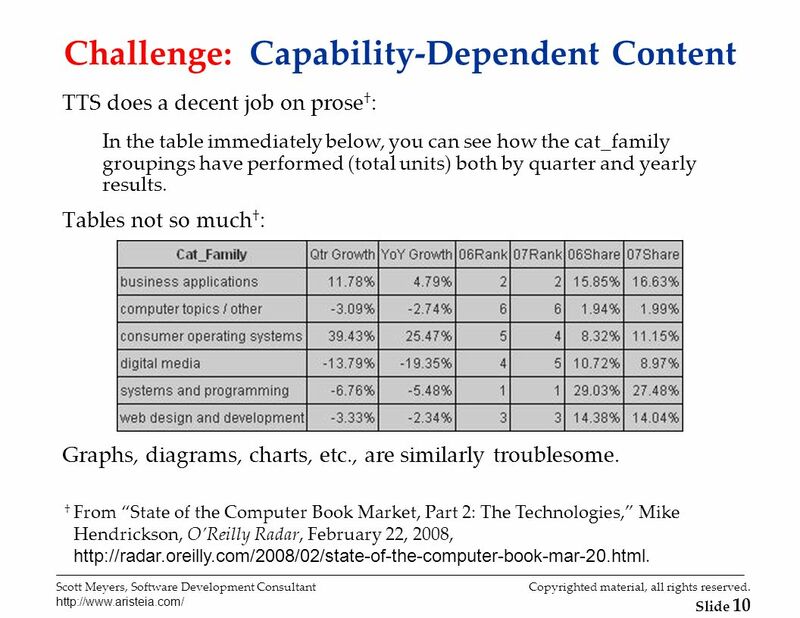 Expression of capability-dependent content. Application of capability-dependent formatting. Specification of cross-references and links. Publishers should experiment, collect experience, and disseminate the lessons they learn. 21 Scott Meyers, Software Development Consultant http://www.aristeia.com/ Copyrighted material, all rights reserved. 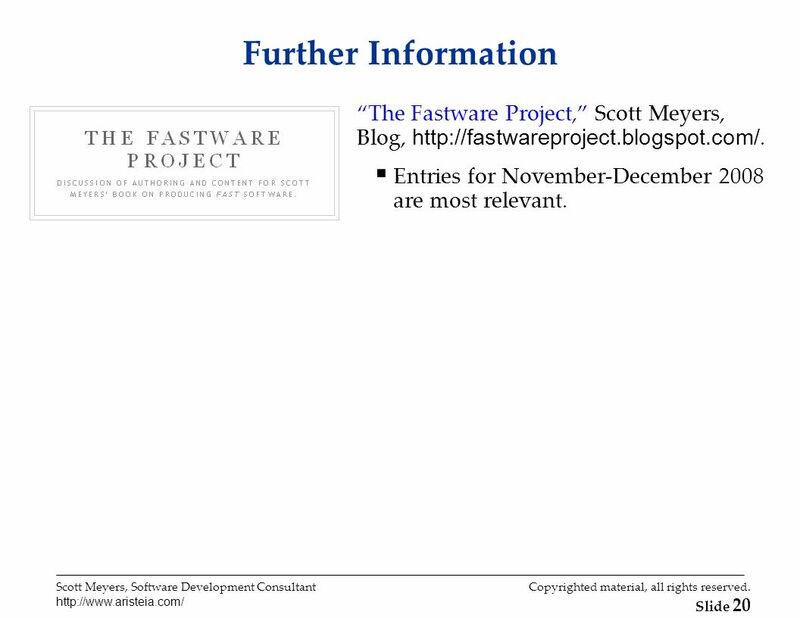 Slide 20 Further Information The Fastware Project, Scott Meyers, Blog, http://fastwareproject.blogspot.com/. Entries for November-December 2008 are most relevant. 22 Scott Meyers, Software Development Consultant http://www.aristeia.com/ Copyrighted material, all rights reserved. 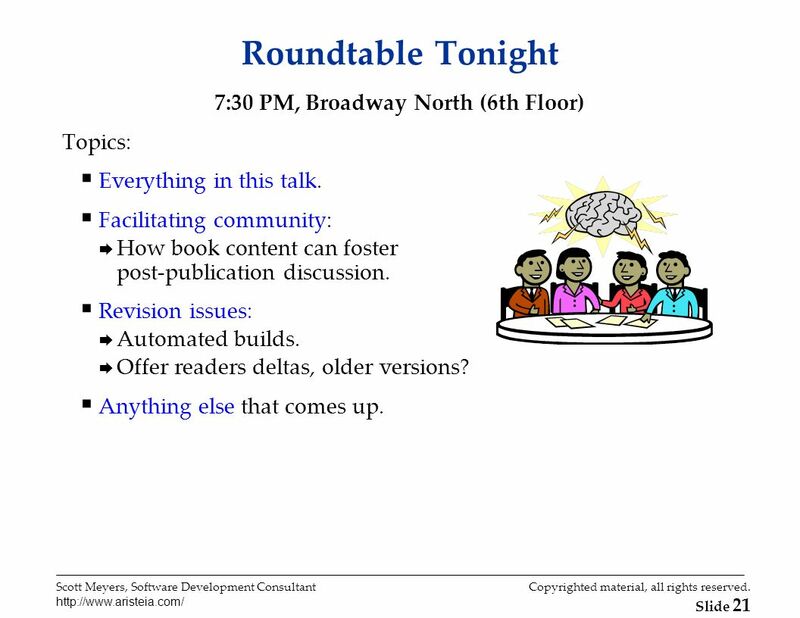 Slide 21 Roundtable Tonight 7:30 PM, Broadway North (6th Floor) Topics: Everything in this talk. Facilitating community: How book content can foster post-publication discussion. Revision issues: Automated builds. Offer readers deltas, older versions? Anything else that comes up. Download ppt "Scott Meyers, Ph.D. Software Development Consultant Voice: 503/638-6028 Fax: 503/638-6614 Scott Meyers,"
Web Center Certification Sitemap / Formatting Content Web Center Certification Training Intuit Financial Services University. Copyright © 2001, Prentice Hall, Inc. CHAPTER 15.